Malicious attacks on computers and their users are frequently in the news. One of the more common attacks is 'phishing' in which fake websites are set up to trick users into entering their details. Not only do phishing emails often look authentic, hackers can also make the websites they point to look authentic. 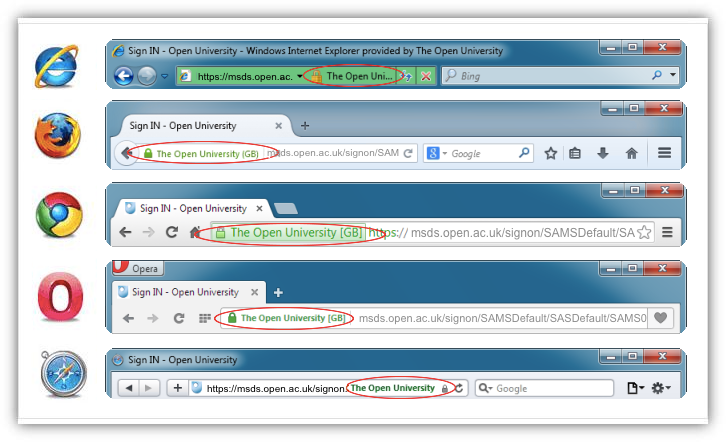 To help you feel secure you are logging into a genuine Open University website, we use extended validation SSL certificates ('green indicators') on our OU authentication web page. This green indicator gives a visual indication that the site you are viewing is verified as authentic. When you see the green indicator and padlock symbol displayed in your browser (circled in red below) you can trust you are entering your username and password into a secure and authentic site. If you receive an email containing a link that goes to an OU web page that asks for your username and password but does not have the green indicator or padlock symbol, it is not a real Open University website. Do not enter your details on the site. This website is developed and maintained by Online Student Support Services. This page was last updated on 24 April 2015 at 14:35:04.